In Belgium, far right ideas are entering the political mainstream. Over the last four years Belgian premier Charles Michel’s government had rallied a broad swath of the Right. In 2014 his Reformist Movement and its liberal allies made a pact with the Flemish nationalists of the New Flemish Alliance (N-VA) and the Flemish Christian Democrats, uniting on a Thatcherite platform of increasing the pension age and slashing sickness benefits. Yet other differences lingered. While the liberal parties admire French president Emmanuel Macron, the Flemish nationalists stand much closer to Hungary’s Viktor Orbán. And with national elections just months away, last week the N-VA decided to pull the plug on the government. The stated reason: the Prime Minister’s support for the United Nations’ Global Compact for Migration, which foresees international cooperation on handling this issue. Indeed, the fall of the Belgian government sheds light on a worrying development, extending beyond its borders. Today, the whole political climate is shifting to the right. Not only is nationalism the talk of the day, but social movements are under attack and universal human rights are under threat. Ideas which until recently seemed the sole prerogative of the far right are now becoming mainstream: not just in Belgium, but around the world. The Migration Compact has, indeed, become a rallying point for the international far right. If a United Nations spokesman insisted that “it is against all logic to imagine that migration could be regulated without international talks,” this was of no concern to the far right, which has instead seized on the Compact as an opportunity to stir up anti-migrant sentiment. Donald Trump’s former campaign leader, the multimillionaire Steve Bannon, has promised “a right-wing populist revolt on the continental scale, starting with the European Parliament elections of next year,” and to this end has joined forces with the Flemish nationalists. On December 8, Jan Peumans, N-VA chairman of the Flemish parliament, allowed the explicitly far-right Flemish Interest (Vlaams Belang) to organize a meeting in the parliament along with figures including both Bannon and French far-right leader Marine Le Pen. The campaign has also joined them together with other such forces around Europe and internationally. It was no coincidence that N-VA propaganda copied and pasted images from a campaign by the German far-right party Alternative für Deutschland. This process is called “fascistisation”. The word originates in the 1920s, just before Adolf Hitler took over state power in 1933. Back then, a combination of shifts to the right, authoritarian measures, repressive laws, and racist ideas step by step prepared the ground for the Nazi power grab. It is not unlike that story of slowly boiling a frog, without it noticing the water gradually getting hotter. It is a double process. Democratic and social achievements are brought down one after another, at the same time as far-right ideology penetrates public opinion. We see this shift even within the N-VA’s public discourse. When, in 2012, Filip Dewinter, leader of the far-right Flemish Interest, challenged the Geneva Convention on the rights of refugees, N-VA man De Wever offered a strong rebuttal: “Those are human rights, Mr. Dewinter. I’m shocked that you are questioning these.” Yet since then, Bart De Wever and his party have aligned to Dewinter’s view. If the Universal Declaration of Human Rights issued in the wake of World War II insisted that such rights are meant for everybody, for the N-VA chairman today they only count for the citizens of his own nation. Radical Enlightenment thinkers insisted time and again on the universal character of human rights: all of us are born with the same inalienable rights, free and equal. Without fundamental rights, a citizen is delivered up to arbitrary choices of the authorities. And in De Wever’s discourse, human rights like social security are instead presented as a right for citizens only — not inalienable rights obtained by birth, but a conditional right that has to be acquired. This “conditionality” is created by the policies of fear. Fear that the West will be “submerged” by refugees. Fear that the Compact of “illegal migration” will promote an “influx” of immigrants. All this has repeatedly been proven to be untrue. But De Wever repeats over and over again that refugees are not refugees but “fortune seekers” undermining “our social security.” This comes from a governing party that has in four years in office done nothing but dismantle the Belgian social security system. The basic claims behind this narrative are also untrue. In fact, the Migration Compact does not change anything about Belgium’s current migration laws. But truth matters little. Creating fear is essential, as is finding a scapegoat down on the social ladder, in order to avoid any questioning of the cheating, the swindling and fraud at the top of society. That fear feeds racism, fanned by hateful politicians such as former N-VA State Secretary for Migration Theo Francken, and on social media by fascists like Dries Van Langenhove from the fascist youth organization “Schild & Vrienden.” For them, racism has to become the new normal. They create different categories of people, each with a different level of “access” to human rights. Forced to hand in his resignation last Tuesday, Michel is now set to head a caretaker administration until the election scheduled for May 26. In sparking a political crisis set to drag on across the next few months, N-VA also wants to prove that Belgium, with its various communities and regions, is “unmanageable.” It’s like putting a stick in your own wheel and then complaining your bike doesn’t work anymore. In the next months, nationalism will again be on the agenda, not just against migrants but also against “the Walloons” from French-speaking Belgium. According to its party statutes, N-VA still stands for an Flemish nation independent from Belgium. For this party, this “Flemish nation” is an “objective fact” that stands above all class conflicts and all individuals. There are no more contradictions between wealthy bankers and low-paid employees, between tax-evading multinationals and hard-pressed workers, between the rich and the poor. All are an “organic” part of the Flemish nation, led of course by the “elite.” As De Wever put it, “VOKA [the Flemish business organization] is my boss.” What he means is: VOKA is everyone’s boss. Everyone has to identify with that Flemish nation, and with this Flemish elite. 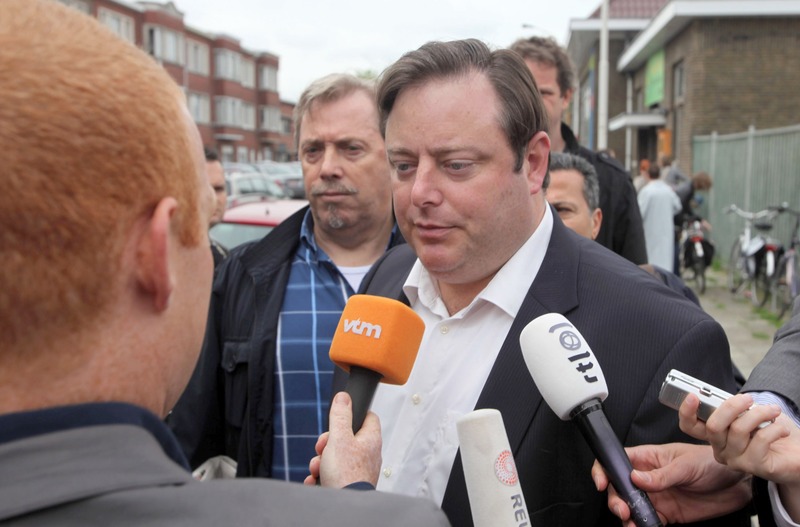 De Wever’s vision relies on so-called “objective group characteristics.” For instance, the fact that you are Flemish by birth, or that you speak Dutch. But most important to him is the “subjective consciousness” of nationality. Flemish people and newcomers not only have to speak Dutch, but above all have to “see themselves as Flemish” and agree with “the moral order of the community.” The difference with the far-right Flemish Interest is that for N-VA, outsiders can become part of the big Flemish club, but only if they completely adhere to the “moral order” of capitalist Flanders. N-VA thus seeks to sell its nationalism as “humanitarian and civic,” as opposed to Flemish Interest’s “ethno-racial” nationalism. But in reality, the policy differences are minimal. Hungarian prime minister Viktor Orbán is a political friend of N-VA man Theo Francken (until this week, Secretary of State for Migration) and a model for the fascist Dries Van Langenhove. Orbán’s power structure is founded on the Hungarian “national community,” just like the Flemish nationalists’ own, and today in Hungary we see what such a “community” really means. The government in Budapest this month introduced a new “slave law” which imposes up to 400 hours of year overtime on each worker — to be paid only after three years (if ever). In Orban’s “national community” the workers have to do as they are told by the big bosses, be they Hungarian or German. And yet protests against the slave law are rising fast, shattering illusions in such an end to class contradictions. Wherever the far right holds power, opposition forces in society are banned or restricted. Nothing can be allowed to stand in the way of the dream of an “organic national community,” and least of all organized critical voices. For the international alt-right, the big bogeyman is “May ‘68” and its legacy. From their perspective, the far right have good reason to hate this legacy. The wave of democratization in May ’68 and subsequent years saw many new bottom-up initiatives emerge. Neighborhood committees, doctors’ collectives, youth centers, cultural groups, women’s organizations, peace movements, anti-racist organizations, environmental movements, and all kinds of action committees were sources of democratic creativity. A large and diverse civil society arose as an essential and necessary part of democracy. Today, the far right is seeking to eliminate these civil society organizations’ autonomy, with one decree after another designed to integrate them into the system. For the Flemish nationalist N-VA, all social bodies have to be part of the “creation of Flemish culture” and ambassadors for “building the Flemish community.” A case in point was the sacking of the Flemish government’s diversity officer Alona Lyubayeva after she dared criticize the policies of N-VA Minister for Equal Opportunities Liesbeth Homans. The same goes for trade unions. Militant and critical trade unions have always been a thorn in the side of Flemish nationalism. “To work is beneficial, to strike is harmful” was for long time a central slogan of the Flemish Block (forerunner to Flemish Interest). The same goes for the N-VA. But they go further, seeking to destroy trade unions’ role in collective bargaining. Such far-right ideas are today becoming part of the political mainstream. The United Nations Migration Compact was the trigger for the government’s collapse, expressing real differences between the parties in Michel’s coalition. And yet with nationalism bound to be on the political agenda across the next few months of crisis, we see a dramatic reactionary shift also on other fronts. In Belgium as in Brazil or Hungary, this radicalization of the right is, at the same time, the advance of an elitist vision of society in which rights are trampled on and social movements attacked. And when the reactionary offensive takes to so many fronts, so, too, must our resistance. Herwig Lerouge is a member of the research department of the Workers’ Party of Belgium (PTB-PVDA).